Our propeller zincs arrived the day after our off-trail hike, so then it was back to work, specifically to scuba diving in the Bering Sea. . . . Normally, we haul Celeste out of the water before the start of the season to pressure wash the hull of any growth and to put on the new propeller zincs and propeller shaft zincs (which protect each item from corrosion). But there’s no way to do that on Unalaska, so instead we had to do it all underwater. We wanted to keep one of our two scuba tanks full in case of need later on, so only Seth went diving. I was on the dock to hand him tools and the zincs and to help him out of the water at the end. When I wasn’t proffering Allen wrenches and a replacement screw for one Seth dropped (understandably given the cold water and thick gloves! ), I scrubbed the waterline and below with the deck brush. Poor Seth did get very cold, but fortunately it wasn’t as bad as he expected and his 7mm wetsuit with hood, gloves, and boots worked well. The prop and shaft were in good condition; the zincs went on smoothly after the lost screw; and the algae came off easily. So easily in fact that we think anything we didn’t get with our brushes will come off just by sailing. 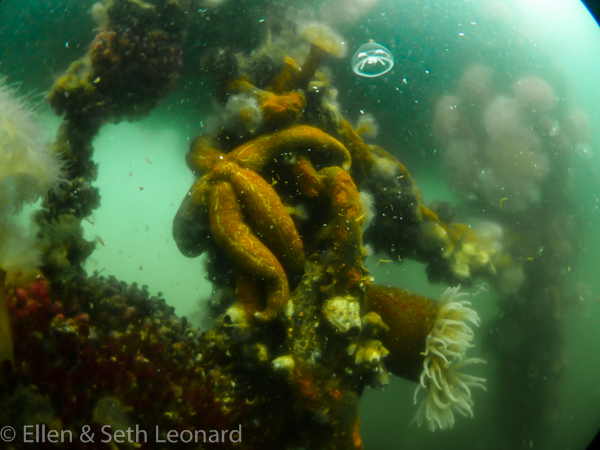 Before getting out, Seth even got a few pictures of the beautiful starfish and anemones on the pilings. After I rinsed the dive gear and Seth took a hot shower, some delicious dark Alaskan beer was very welcome! That was the only big project for the next couple of days: otherwise we stowed the rest of our gear below and on deck; Seth worked on his PhD thesis, and I tried (trying being the operative word) to catch up with emails, articles, and this blog (I’m scheduling these posts to come out after we’ve started sailing), whenever we got a chance to climb the hill to Andy and Daneen’s house. On the 26th we headed out into Unalaska Bay for a test sail. Our engine with its new alternator started up first try and had no problems. We puttered out of the small boat basin, tied on our reef points, and hoisted the main with one reef. Then we rolled out our new jib. The halyard tends to wrap around the forestay, so that was something to deal with upon return. Otherwise our beautiful new jib looked great. We’re very happy to have it and no longer worry about the old one bursting. Unfortunately our autopilot didn’t seem to be working so that was another thing to investigate. We went towards the mouth of bay, which is essentially open Bering Sea. The swell was rolling in and the wind getting up, about 25 knots with consistent white caps and dark ruffled water. A nice test for the boat (which she passed) but not so good for halibut fishing, which was the other motivation for the sea trial! We’d taken out a friend of ours, Mango, and we were all hoping to get a halibut, but even with all sails taken down, we drifted too fast to get our lines to the 100ft bottom. We were all heartened to learn a few days later that almost no one caught one during the halibut derby on the 28th. So we weren’t alone! Categories: Aleutian Islands, Arctic Voyage, Boat work and gear | Tags: Adventure, Aleutian Islands, Boat work, Diving, Fishing, Friends, Gear, Photography, Sailing | Permalink. Even though there is a bit of hard work to start with, it must be good to be back on board and sailing! Enjoy! So cold. Did you get a water temp reading? Sadly, no. A thermometer is on the list! Looks like a cold way to clean off the bottom of the boat, glad it went well. Too bad about the halibut. Definitely cold, but important to get the zincs on! Maybe next time for the fishing, I hope!! So glad you’re enjoying the posts! This definitely isn’t the warmest part of the world, that’s for sure, but you adapt and we’ve actually had surprisingly sunny weather!